If an ounce of prevention is a pound of cure, then what’s a backpack full of prevention when it comes to reducing back and neck pain on the bike? For cyclists who commute daily, getting to work by bike often means carrying extra clothing, food, and work or school materials such as laptops and books. The weight can add up fast. Ideally those loads should be carried on the bike frame either in panniers on racks, or loaded on a porteur-style front rack. But sometimes it’s not always possible or practical for add racks and bags to your bike, in which case riding with a backpack becomes necessary. 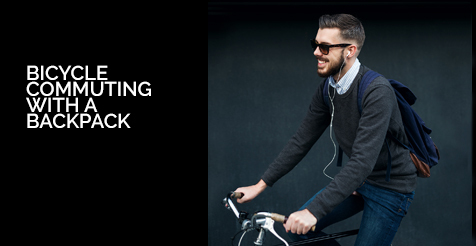 Riding with a backpack places additional strain on your musculoskeletal system, often creating tension in back and neck muscles, and straining wrists and hands. Even a mere 10 pounds is enough weight to cause problems, and of course the more weight you add, the greater the discomfort and stress on your body. So what’s a well-intentioned, budget-conscious bike commuter to do? According to Kevin Schmidt, physical therapist and founder/owner of Pedal PT—a full-service physical therapy office in Portland, Oregon—there are some steps you can take to fit reduce strain while riding with a backpack. A wider strap placement on the shoulders is much better than closer to the neck. By spreading the load, it’s much less irritating to your neck muscles, nerves, and upper ribs. The closer your straps are to your neck, the greater the workload for the upper trapezius and levator scapulae muscles, which can then lead to neck pain, burning, and headaches—not fun. Simply widening the distance between the shoulder by a mere 1-2” (2-5cm) can make a significant difference in most cases. For messenger bags, wear the strap out towards the point of your shoulder (called your acromion process), again away from your neck. Of course, wearing a backpack with two shoulder straps is nearly always better than a single-shoulder bike messenger style bag, which loads your back, shoulder and neck muscles unevenly. This is an especially important consideration if you’re working with a scoliosis. Where you carry the weight is also an important consideration. Schmidt advises to carry the weight low on your back, not up near your shoulders and neck. This is easily accomplished by loosening the shoulder straps a bit, until the bulk (of the load inside) is closer to your lower back (roughly below the shoulder blades when flexed forward over your bike, hands on handlebars) as your bag’s straps will allow. The goal is to have the load pulling you more down and back on your shoulders, which aids in opening the chest while encouraging thoracic back-bending (i.e. extension). This leads to a better general commuting posture on the bike. This set-up may feel awkward when you dismount and begin walking around with it, so Schmidt advises shortening the straps to snug the load against your body for walking. If an ounce of prevention is a pound of cure, then several pounds of prevention—easily achieved by setting up your load and pack properly—ought to make your bike commuting much less painful and more pleasant. I can (almost) guarantee it might just help you ride stronger and faster, when you’re not distracted by discomfort. See the original post in its entirety, here. For more information about Pedal PT’s approach to cycling-specific physical therapy, visit their website at pedalpt.com.